A friend of mine had trouble with his outboard motor one Sunday morning in the early summer of 1975 while boating in the Brockville area. (Brockville is located on the St. Lawrence River about 50 miles east of Kingston, Ontario.) The repair shops were closed but the "River Rats" directed him to a backyard mechanic that could "repair anything." When my friend arrived at the mechanic's house, he was amazed to find such an array of junk. There were parts of cars, mostly newer ones of 65-70 vintage; old woodburning stoves, a large school bell, and of course the 1928 Durant that I would buy and a 1924 Star which I felt that I could not afford. The Star was priced at $4000 and was complete, good shape and running. The Durant was $800 delivered to Verona, which is 75 miles away. The outboard was soon repaired and my friend was on his way, with the balance of the weekend spent thinking about the two old cars. The first thing Monday morning he barged into the office to tell me about the cars. He described the Durant as a piece of junk that had potential. I couldn't believe that he'd found a roadster. After making a couple trips to look at the cars, I made a deal for the Durant and had it delivered on Thanksgiving Day (early October in Canada). The car was built at Leaside and spent most of its life in the Ottawa area. It had last been licensed in 1950 and had received very little care since that time. I got started sometime in November, to dismantle the "pile of junk" and take an inventory of parts. By the summer of 1976, the drive train was ready and received its first successful road test. All parts of the chassis were gone through and restored to original specifications. It may be of interest to note that the kingpins I used were N.O.S. for a 1932 Plymouth and a great number of other replacement parts could be matched up with General Motors parts. With the chassis completed, my attention was turned to the body. The sheet metal was worse than originally judged and I found that every panel required many hours of work to restore them to the original condition. The wooden structure that the metal is attached to had to be replaced first and while most of the original pieces could be used as templates, the job was still difficult. The original maple was replaced with oak. During the winter of 1976-77, many of the small parts were finished. These included the headlights, bumper brackets, steering column and the dash and instrument panel. I did the instrument panel with an antique enamel and replaced the lettering, it really looks good. I reupholstered the door panels and kick panels with a brown leatherette and my neighbor did the covering on the seats. I bought some good seat springs from a local dealer. The top was done by a professional "modern car" shop. 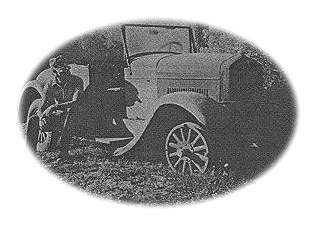 Two of the most difficult problems that I encountered were, locating the proper trunk hinges and getting the lid to raise and lower properly and with ease, and getting the clutch properly adjusted. The car is equipped with a trunk, but I think it could easily be converted to a rumble seat. The entire restoration took about 2 ½ years, with many of the needed parts coming from the western United States. 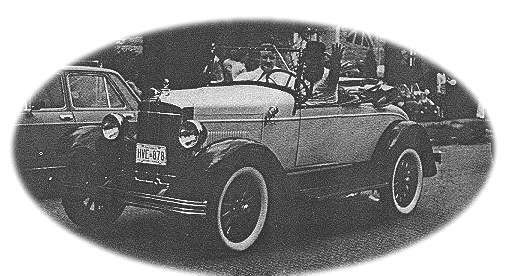 Editor's note: Ed is shown driving his 1928 Durant M-2 roadster in a local parade.